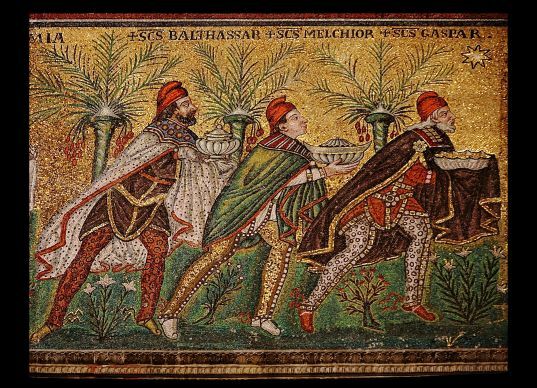 The magi follow the star in this sixth-century mosaic at the Basilica of Sant’Apollinare near Ravenna, Italy. Your Jitterbug Quote of the Day down below is from the professional star-gazer Nick Strobel, a scientist who is a devout Christian. And yes, a scientist can be a devout Christian and a devout Christian can, and should, for God’s sake, believe in science. The Bible was written by men who spent a lot of time gazing at the moon and the stars and the lands and seas and rivers and trees and all the natural provisions around them. These men were not scientists, as there was no such thing as science. Nor were they reporters reporting the news with verifiable facts or historians who wrote with footnotes to corroborate historical accounts. Scientists and other such modern-era professionals deal in hard facts and truths (with a little t). As the scientist-Christian Strobel explains about the Bible’s account of (supposedly) Three Wise Men and the Eastern Star, the disciple-turned-gospel writer Matthew was a Truth-teller–and that’s Truth with a capital T.
Science can tell us a lot about the stars–how they are formed and how they die and why they shine in the night sky. But science can’t explain the meaning of life and the magnificent mystery of love. Click here for more about Strobel’s take on the gospel of Matthew and the Star of Bethlehem in a United Methodist News Service feature by Heather Hahn.